MTDA now offers a new program, MTDA “Short Courses.” A Short Course is a short online learning experience that helps students experience the distance learning environment at their leisure, without the pressure of deadlines or forward motion in the program. Although student progress is monitored by MTDA central office staff, there are no teacher services available in this format, and the courses are not offered for credit. We will start this fall with orientation courses. Over time, MTDA plans to roll out additional titles, covering everything from digital citizenship, to introductions to Google Suite for Education and Office 365, to pre-semester preparation for math courses utilizing EdReady Montana. Upon completion of the course, MTDA staff will “exit” the student from the program, with a “P” designation on their grade report. These courses are enrollable in GeniusSIS. Please choose the “Short Course” term on the enrollment information screen. Students will explore the Montana Digital Academy credit recovery program, including the student requirements, available resources, and strategies for success. The student will also practice functional elements of the program, including turning in assignments and completing quizzes. Successful completion of this orientation program is required to enroll a student in an MTDA credit recovery class. ** This replaces the previous Credit Recovery Orientation program. Students will explore the Montana Digital Academy original credit program, including the student requirements, available resources, and strategies for success. The student will also practice functional elements of the program, including turning in assignments and completing quizzes. 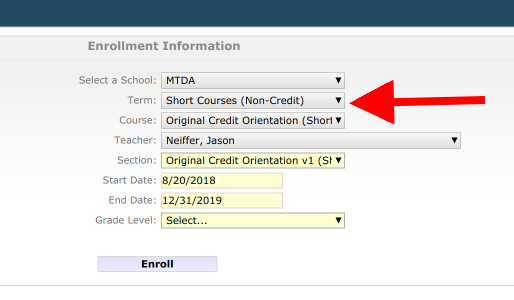 Although this orientation is not required to enroll in an original credit course, sites are encouraged to use the orientation program for first-time MTDA participants. If you have any questions or feedback, we encourage you to contact the MTDA team in Missoula, support@montanadigitalacademy.org.